Planning bathroom or kitchen renovations? Excellent! Upgrading your bathroom and kitchen can be a great boost to both the value and livability of your home. Squires Plumbing are available to renovate your bathroom, kitchen or laundry. Why not revive your seventies style bathroom, this could be as easy as putting in some new tapware and a modern vanity, or the entire bathroom can be renovated. Give your kitchen a face-lift – install a new stainless steel sink with a modern look and modern flickmixers. Planning bathroom or kitchen renovations? Excellent! Upgrading your bathroom and kitchen can be a great boost to both the value and liveability of your home. Before you get started, contact Squires Plumbing for invaluable advise on pipework, fixtures and fittings. Our fully qualified plumbers are skilled in all areas of bathroom and kitchen renovation plumbing, and work well with other trades to ensure a smooth renovation from start to finish. Require a free quote? Contact us now. We can supply the fixtures and tapware for your renovation project or you can purchase these items yourself. It is a good idea to speak to Squires Plumbing about your project before purchasing anything as certain fittings will require less alteration to your existing pipework than others – saving you time and money. Our suppliers Reece and Tradelink have an extensive range of fixtures and tapware that can be viewed online. This depends on the complexity of the job and the other trades involved, but most renovations are completed in 5-30 days. Disconnection of all existing fixtures, in readiness for owner / tiler strip-out. Moving water and waste pipes into their new positions, installing a bath and any in-wall mixer taps, then mudding the walls and concreting the floor in readiness for the tilers’ screed coat prior to water-proofing and tiling. Where possible we prefer to have all plumbing fixtures and tapware on site during this visit to help with positioning. 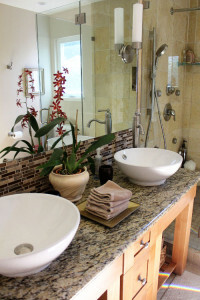 Once the room is tiled, we fit all other bathroom fixtures such as toilets, vanity, basins and showers. We always go the extra mile and install the best quality fittings, including mini-stop taps prior to mixer taps, which will help with future maintenance. Variations of the above steps can be tailored to your needs – just give us a call. For many bathroom renovation projects within Hobart, we can commence work within 1 week of booking a job. For a quote and the best bathroom or kitchen renovation plumbing advice in Hobart give us a call.